In ‘96 I was first confronted with the tormented voice of Bill Callahan, who was at that time still known as Smog. Indeed The Doctor Came at Dawn (1996) was a very nice lo-fi album, yet it wasn’t memorable either. What was memorable to me was Smog’s ’second single, ´Cold Blooded Old Times´ that came with the album Knock Knock (1999). Cold Blooded Old Times caused a vicarious sort of heartache to take over one’s mood. This was strengthened when the song appeared on soundtrack of High Fidelity (2000) that is all about heartaches, from a male’s perspective that is. With it Bill Callahan’s qualities were unveiled to the world. On a more personal level both film and track changed my taste in music in a significant way. For one, I got addicted to making top 5 music lists about just anything that comes into mind. And importantly, it made me enjoy bittersweet and introvert indie music on a whole different level. Lucky for me, Callahan releases an album with a one or two year interval. Radical changes in his repertoire are pretty rare. Probably the most notable is the swapping from lo-fi to a simpler repetitive recording style that is heard on Supper (2003) and A River Ain’t Too Much to Love (2005). In 2007 he released first album under his own name and in the years that followed he steadily continued to extend his already admirable discography. If you take his last live album into account Callahan’s latest is his eighteenth (!) full release in roughly twenty years. Although his previous studio album Apocalypse (2011) was of high standards it seems a fair to ask if Callahan can still captivate on Dream River that was released just about a fortnight ago. Well, let see if he is able to do so. 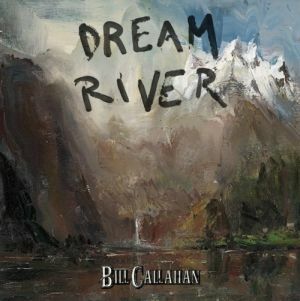 Callahan wants Dream River to be a record you can play just before turning in. Opener ‘The Sing’ lives up to this wish and is an ideal song to a days ending. On the track Callahan peacefully paints a picture of himself in a quiet hotel bar. Surrounded with a few strangers he’s puttering towards the end of a seemingly useless day, “The only words I said today, were: beer, and thank you. Beer, …thank you. Beer, …thank you. ..Beer”. He is however enjoying this relative silence in which he reflects on his own shortcomings as a person. This sort of simple songs characterizes Callahan best. In a very slow pace he peels off observation after observation and places them in a very intimate reality. ‘The Sing’ is therefore more a short poem than a song. And there’s more where that came from. ‘Small Plane’, ‘Seagull’ and the closer ‘Winter Road’ all are timeless stories within stories. Dream River however never becomes a record for sleepwalkers. Firstly, Callahan’s implicit way of singing on ‘Summer Painter’ is cleverly timed with pauses at the right moment to keep listeners close. Also its instrumentation is substantially noisier when you compare it to other tracks. Secondly the music on the album isn’t always of a minimal nature. ’Javelin Unlaning’ and ‘Ride my Arrow’ are illuminated with a panpipe, echoing guitar play and a fragile accompanying piano. These songs are just what sleepy listeners need to prolong their span of attention. Third and lastly Callahan’s wordplay, like always, appeals to the imagination and honors simplicity in its many forms. With Dream River Bill Callahan doesn’t deliver a groundbreaking album. And frankly there is no evident reason for a change to be made. Callahan simply continuous to be a unique singer songwriter who isn’t focused on writing the perfect song but instead writes vivacious short stories that happen to be songs. And if I may add, songs that are seemingly prefect. When this new album is compared to its predecessor, Apocalypse, I must alas conclude that it falls short to this masterpiece. Hereby I must address that Apocalypse is not as specifically themed as Dream River is. For this reason it’s not an ideal introduction to those who are just discovering the work of Callahan. However people who are familiar with his work will most likely agree that on this newest album, Callahan gracely succeeds in his objective to create a wonderful record that it best heard on the edges of the day. This entry was posted in WRM and tagged Ain't Too Much to Love, Apocalypse, beer and thank you, Bill Callahan, Cold Blooded Old Times, Drag City, Dream River, film, High Fidelity, Knock Knock, movie, Music, review, short poem, singer songwriter, Smog, Supper, top 5 music lists. Bookmark the permalink.